Something special, for any occasion and every event. All special occasions are worthy of a portrait album. In Portrait Album, you can celebrate your most important moments, both big and small, and the joys of life that you want to carry with you, forever. A large assortment of materials and colours give you the opportunity of customising your Portrait Albums, right down to the last detail, tailored-made for you and the people the Album is dedicated to. Available in different versions – Idea, Aria, Goccia, Tipo and Tipo Color -, our Portrait Albums are designed as gifts of something special, for any occasion and every event. Portrait Books come in two versions: Fine Art Book – with 3 different printing papers – and Traditional Book – with 5 different Materica papers’ colors – to chose as a window through which you can show your photographs. Make your choice between 4 sizes: two square formats (25×25 and 30×30), one landscape format (30×20) and one portrait format (20×30). Pick the one that meets the best your needs and tastes. Go for one of the 2 Packaging: the Zero.2 box, made from a transparent glossy material, or the Light Box Slick which come in Frost or Milk finishes. A Portrait Album with a laminated cover printed on two sides and Canvas-coated spine. What distinguishes Idea is that you can customize the cover with your own picture or graphic. The range of colors to cover the Album’s spine is enormous: any of the colors and weaves from the Matt, Duo and Bright Canvas ranges, for a product that clearly stands for your own Lifestyle. A small photo, a huge emotion, a vibrant frame to remember the sweet memories of who you are, to hold back a smile or a breathe, up there in the clouds. Designed for Engagement and Coffee Table Book, Aria can be covered in Eco-Leather or Linen. Aria’s distinctive feature is the frame shaped in its cover to place a picture. As a drop of infinity that narrates our existence, it preserves the precious testimonies of life, so, this fine example of craftsmanship in resin (Charm) on the cover becomes a catalysing element, creating that special and unrepeatable bond between people, emotions, memories and silences, coagulated in the time it takes a shutter to open and close. Available with Ecoleather and Canvas. Tipo brings with it the secrets of the ancient technique of Debossing. Small brass blocks incised with letter shapes are manually aligned to form a name. Just like it was with movable type printing press technology, the letters of the text are composed mirror written and reversed. The heat and pressure exerted by the matrix take care of the rest. The imprint is made at the centre of the cover without any color transfer, which is why it is called Dry Debossing. This ennobling technique is used when a sober, elegant result is sought. Tipo is available with Ecoleather, Matt Canvas and Bright Canvas. For Tipo Color, the Debossing isn’t dry, but with the warm pressure, we obtain a color transfer on the text. This process is known as Debossing with Foil. The pigment is a foil colour, just like a coloured wax, which is activated at a very high temperature. You should choose this when you want to have an elegant and highly accentuated effect. 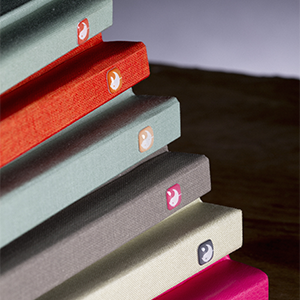 Tipo Color can be created with Ecoleather, Matt, Duo and Bright Canvas, Linens.